Blockchain 101: Is it going to help you? Does blockchain have any application in warehousing and distribution operations? Blockchain is gaining traction in logistics operations, with many organizations jumping on the bandwagon. But will it have an application for distribution operations? Does it have any use in warehousing? The technology was invented in 2008 to securely track bitcoin crypto-currency transactions. Fast forward to 2018, and blockchain has spread into all sorts of transactions. This is no surprise, because it allows collective veriﬁcation of all details relating to every transaction, providing all parties involved with “a huge degree of traceability, security and speed,” says global accounting ﬁrm Deloitte. In the logistics realm, picture a blockchain as an ethereal ledger, one that travels along with a given widget from the factory to the truck, train or ship to the distribution centre, to the delivery truck, to the post ofﬁce or store, and on to the ﬁnal destination. Every time the widget changes hands, the details – date, time, parties involved and so on – are added to the ledger. As this ledger is updated, identical copies of it at all points in the supply chain (the blocks in this distributed ledger chain) are also updated. All parties are aware of updates as they occur, and have to sign-off on (or at least can closely scrutinize) changes requested by any party to past updates. Gavin Parnell, director of consultancy Go Supply Chain, suggests blockchain may confer four advantages in supply chain transactions: more accurate and faster tracking of both products and the distribution assets that handle them; reduced errors on trade-related documentation; real-time information sharing about process improvements; and, a permanent audit trail that will reduce opening for fraudulent activity. Blockchain’s arrival is timely, as logistics is becoming more complex and crowded, with less end-to-end visibility and more issues arising with accountability and auditing, says Michela Menting, digital security research director at ABI Research. Blockchain helps solve these issues, she says, through its ability to automatically organize and store necessary paperwork. “Letters of credit, billing information, delivery routes – this information can be coded into smart contracts and then used to trigger actions and include new participants (banks, delivery ﬁrms and so on) later down the line,” she explains. Blockchain’s ultimate overall value rests in the security and visibility it provides to shippers and manufacturers. “With so many companies involved in the manufacturing, warehousing and transportation process, fraud is always a possibility,” says Kristi Montgomery, Kenco Logistics’s vice-president of innovation. That’s why Kenco Logistics has joined the Blockchain in Transport Alliance (BiTA), a forum with the goals of developing blockchain standards, educating the market on blockchain applications and encouraging its use. 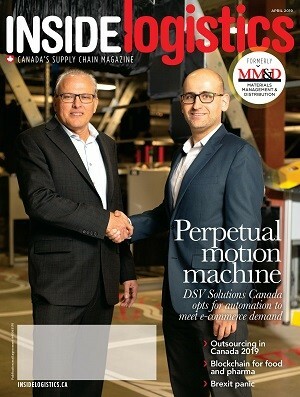 In late March, Purolator also joined BiTA, stating that it did so because, as a leader in the Canadian logistics market, it wants to help shape the future of the sector. “The applications for blockchain are endless and will provide the shipping and logistics industry with never-seen-before beneﬁts,” Ricardo Costa, Purolator’s vice-president and chief information ofﬁcer stated at the time. Purolator wants to see how blockchain can help it improve shipment visibility, agility and delivery speed, as well as provide assistance in exploring opportunities to globalize its products and services. Stefan Kukman, CEO of blockchain solutions-provider CargoX, points to another inventory-related use. Once inventory is below a threshold (calculated automatically based on average usage in previous months, for example, perhaps also including periodic/seasonal factors), a blockchain contract can automatically initiate new orders through appropriate vendors and enable automatic payment in due course. Montgomery says blockchain also could provide inventory control in terms of traceable performance histories of suppliers (measured against chosen metrics), better compliance with regulations such as electronic logging, and true control tower visibility for shippers. 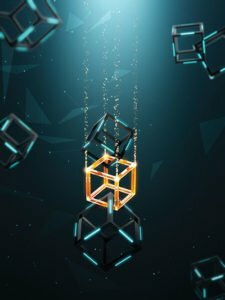 Although blockchain is poised to provide many beneﬁts, Kukman believes its large-scale realization within the supply chain will take some time, occurring only when a regulatory framework exists to support it. In his view, blockchain will mostly be used in the near-term to optimize internal or unregulated processes in small parts of the supply chain.